Anyone else knee-deep in back-to-school sludge? I'm dying, Freebs. Back to school might literally be killing me. Well, my will, soul, and happiness at least. I've gotten so lazy over the summer. Sleep in, play all day, kids are outside and happy, slow schedules, easy (junky) food…sigh. The good ol' days. I feel like I've been slingshoted (is that a word?) onto an insanely fast hamster wheel and people keep throwing me babies and dishes and laundry and homework. I'm out of breath just thinking about it. I'm not the type of person that loves having my face naked. My skin isn't great and my dark circles could eclipse the sun, so I like to have a little sumthin' sumthin' on my mug to make me feel more put together. But let's be honest, sometimes I just don't have much (if any) time! 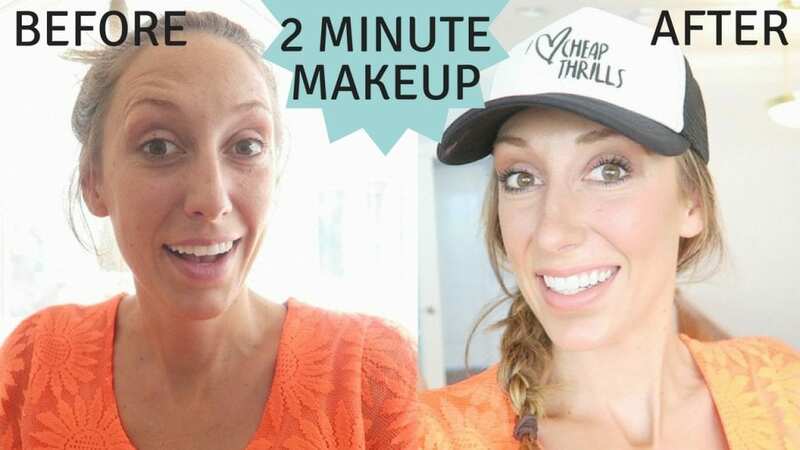 Since it's Thursday, today I'm sharing my 2-minute makeup face, that is bound to make your mornings run a little smoother! For those who may not know, Thursday is YouTube day over here. I post a new video every Thursday to my YouTube channel. You should definitely subscribe because we have a lot of fun over there. We obviously talk a ton about budgeting and frugal living, but we also cover parenting, organization, and whattya know, beauty. A cute trucker hat! I have loads to choose from with my new line of trucker hats! Get yours here! So there you go! All you need is 2 minutes and a few products, and you can feel a little less like a mom-zombie too ;). Have a great day, Beauts! It is same like preparing Maggie in 2 minutes. Thank you, beautiful work, Love to enjoy the makeup in the two minutes. So fast! That would save me having to do it in the car! Just got the maybelline under eye concealer to try. My dark circles are taking over!! Wish I looked this good. I implemented a lot of these and they WORK! All the heart eyes. Such a simple and easy look to follow. I don’t wear make up very often but having been leaning more towards having some daily make up to look more put together as I’m starting to feel frumpy. I’m gokng to try and get some similar product like you used. You make it feel so much easier than it seems when it comes to actually pulling myself together! 😉 contouring scares the crap outta me; guess I just need to practice! You are a rock star! Your make up tips are amazing! That cream looks awesome! I love quick and easy makeup. And e.l.f. is the best! Thanks for the tips! Two minutes is definitely doable. Thanks for sharing your tips. I totally went out and bought all these products and I LOVE them!!!!! Thanks for sharing!!! Thanks for the great tips! Not your average mom! I struggle with makeup on a daily, thanks for these great tips!! 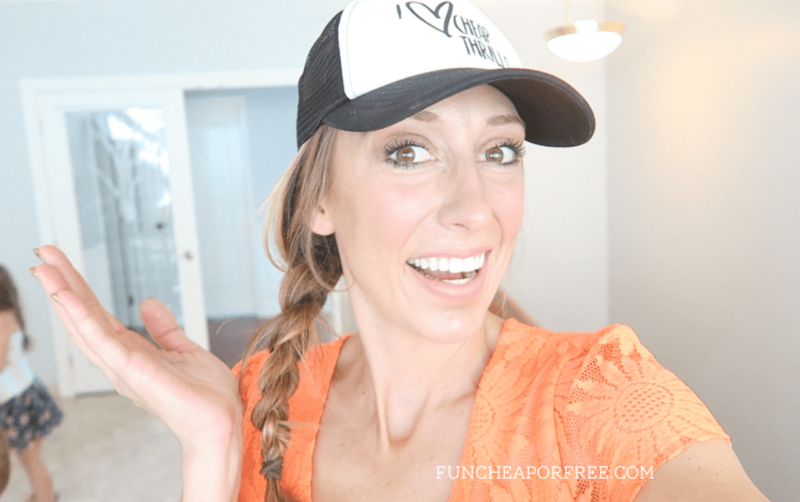 Love that you use inexpensive quality makeup! I really need to try doing more quick makeup. Sometimes I’m an ‘all or nothing’ kinda girl, unfortunately! LOVE it when you show (inexpensive yet good) makeup hacks and tutorials!! 100k give aways! The Almay mascaras are my favorite! Do you have any tips on getting good deals on makeup/beauty products??? Do you ever buy the big packs of makeup stuff at Costco? Its SO refreshing to find a post about make up that doesn’t require me to spend big $$ to get the look! THANK YOU!! I need more of these quick makeup tutorials in my life! This is a game changer! I need to practice this more often because I spend WAY too much time putting makeup on. 🙈 this quick and simple routine is totally doable daily! Thanks for sharing! I love this look. I feel like I am usually all or nothing with my makeup, so this is a great idea for quick days. Nothing better than quick makeup!!! Love the tips!